Detect and decode patterns known as ARtoolkit markers, which are small 2D barcodes often used in augmented reality and robotics. See https://archive.artoolkit.org/ - This module uses version 5.x for now. This algorithm is very fast. It runs at 400+ frames/s at 320x240 and can easily sustain the maximum 15 frames/s of the JeVois camera sensor chip at 1280x1024. It may be interesting to combine it with other algorithms running on the quad-core JeVois processor (see for example the MarkersCombo module). Also see the files in jevoisbase/Contrib/ARToolKit5arm/doc/patterns/ for more. When msg3d is turned on, 3D messages will be sent, otherwise 2D messages. For information about camera calibration and obtaining precise location, distance and pose estimates, see this tutorial. Definition at line 92 of file DemoARtoolkit.C. Definition at line 96 of file DemoARtoolkit.C. Definition at line 102 of file DemoARtoolkit.C. Definition at line 98 of file DemoARtoolkit.C. Definition at line 104 of file DemoARtoolkit.C. Definition at line 106 of file DemoARtoolkit.C. References itsARtoolkit, jevois::Timer::start(), and jevois::Timer::stop(). Definition at line 108 of file DemoARtoolkit.C. Definition at line 126 of file DemoARtoolkit.C. References jevois::rawimage::drawFilledRect(), jevois::RawImage::fmt, jevois::RawImage::height, itsARtoolkit, jevois::rawimage::paste(), jevois::RawImage::require(), jevois::Timer::start(), jevois::Timer::stop(), jevois::RawImage::width, and jevois::rawimage::writeText(). Definition at line 128 of file DemoARtoolkit.C. 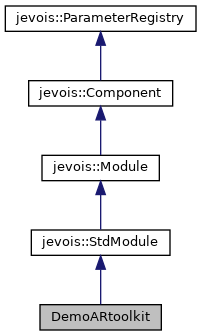 References jevois::rawimage::drawFilledRect(), jevois::RawImage::fmt, jevois::RawImage::height, itsARtoolkit, JEVOIS_REGISTER_MODULE(), jevois::rawimage::paste(), jevois::RawImage::require(), jevois::Timer::start(), jevois::Timer::stop(), jevois::RawImage::width, and jevois::rawimage::writeText(). Definition at line 167 of file DemoARtoolkit.C. Referenced by DemoARtoolkit(), and process().